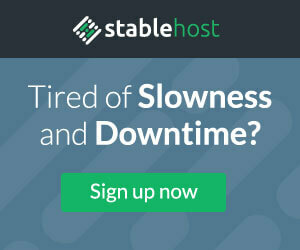 Stablehost.com is the most cheap quality reliable web hosting, I try to manage the cpanel on stablehost in my last job in web development company it’s very very good, no regret on it. I’m satisfied on stablehost because it’s cheap, fast and quality, the other 2 popular web hosting such as Hostgator and Bluehost are quality too, but the renewal price is too expensive, after your first contract the price will be increase (see the table below) . like in stablehost the renewal price is the same amount! I Strongly recommend this web hosting for WordPress Self Hosted Website, which is we will be covered to “WordPress tutorial for beginners” in my Youtube Channel. If you Purchase, to avail the 40% off kindly copy and use this coupon code to the ‘Review and Checkout Page’. The 2GB Memory is enough for your Web Hosting, you websites can’t consume that all, even my own website, and YES stablehost has support Let’s Encrypt. Let’s encrypt is free SSL Certificate (Open Certificate, SSL Domain Validation), not all Web Hosting are not supported Let’s Encrypt, the Hostgator and Bluehost are not supported (need additional fee’s to get SSL). Good news in stablehost which is FREE, Every Let’s encrypt SSL Certificate is valid for 3 months but it will renew automatically by system so your website have SSL Certificate forever while you hosted in stablehost. This Price Comparison is not a LIE, this is true, i browse those 3 Web Hosting and i compare the price both of ‘Discounted Price for New Customers’ and ‘Renewal Price’, If your curious you can visit those website and compare you own. I did not compare the months and 1 year package, because that’s to short, the good choice is 2 years, but the best choice is 3 years, because you get more discount. “Every web hosting company coupon codes are reserved for first time customers only, If you have signed up using a particular domain, you may not resign up for that domain using another coupon at a later date, if they found in violation of these policies will be reviewed by our sales department and the appropriate invoices will be added to the account. Coupon abuse will not be tolerated and may result in the suspension or termination of the account”. 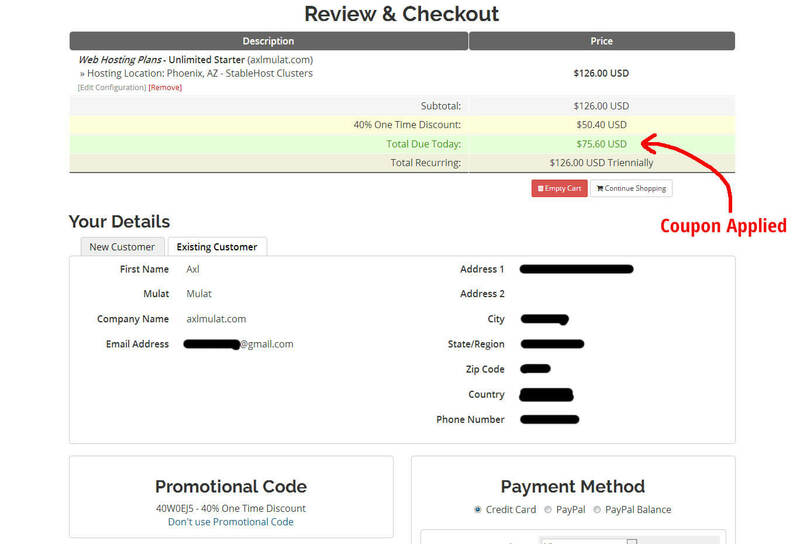 “So you can use discount coupon once”, if you break your account will be terminated !!! In Bluehost i put ???? in 24 months, because i did not find the source, but i believe that’s expensive too, because the 36 Months Price is expensive. 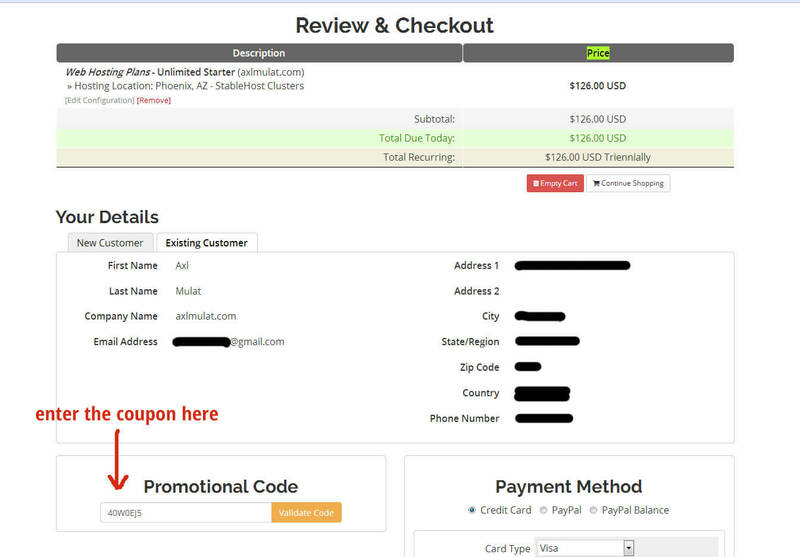 And after you apply the coupon code your total bill are 40% discounted for single domain in this example. No regret on recommending Stablehost other than 2 or any other cheap web hosting, because Stablehost is a quality web hosting and Fast because SSD powered.